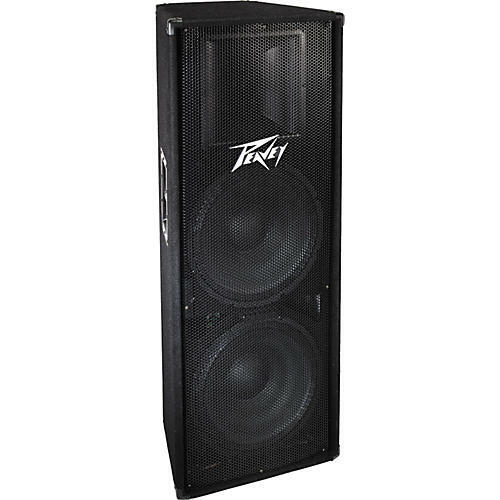 The Peavey PV 215 Dual 15" 2-Way Speaker Cabinet is loaded with double 15" speakers in a trapezoidal enclosure and is capable of handling 700W program and 1,400W peak power. Loaded with 2 - 15" premium woofers with a 2-3/8" voice coil for pumping plenty of low end. Built-in tweeter protection and a heavy-duty crossover supply the RX14 compression driver with clean power for the 90 x 40 degree constant directivity horn, while the carpet-covered cabinet and sturdy metal grille make the PV 215 a road-rugged loudspeaker.